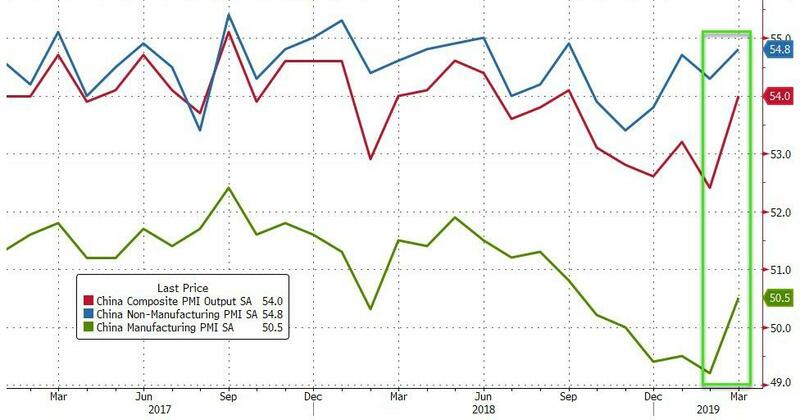 China’s manufacturing PMI rebounded strongly from a contractionary 49.2, and printing at 50.5, its first expansion since September 2018, and beating estimates of a 49.6 reading. The non-manufacturing PMI continued its recent improvement, rising to 54.8, also the best reading since last September, as both the services and construction PMIs strengthened, and resulted in the composite PMI rising to 54.0 from 52.4. ← La globalisation financière et commerciale, c’est fini. Fuite devant le dollar en raison des sanctions.